Colombia Revolution shared a special game with ChCh Chicks (NZL) to complete their pool play schedule on Monday afternoon. The two teams are staying in the same hotel and were in the Hips Don’t Lie challenge together during Saturday’s opening ceremonies, and it was clear the two had a bond beyond what would normally be seen between opponents playing each other for the first time. It was one of the most spirited games I saw on the day. The two teams’ spirit captains even met with each other at halftime, to ensure that the other side was happy with how the spirit game was going. 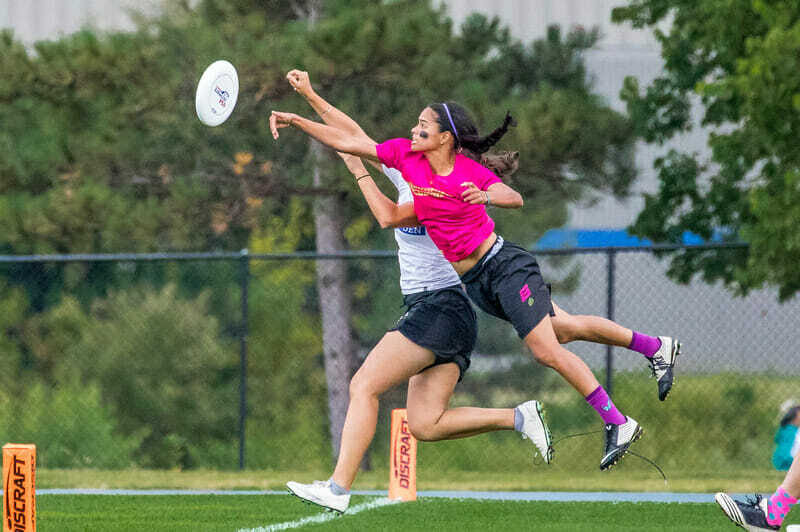 That was a first for Maddy Frey, who’s playing in her fourth World Ultimate Club Championships.1 Frey revealed after the game that Chicks also shared a similar sense of humor with Revolution, a team that already seems to always be laughing. The shared laughs with Chicks go back to the spirit circle Revo had with HUCK (JPN) after a pre-tournament scrimmage. HUCK had each of the Revolution players draw pictures of themselves, and Manuela Cardenas “drew this really horrible stick person,” as Frey described. “It looked like a sailboat with a head, basically, and like a weird disc. So we were just mercilessly making fun of her,” she said. The image was even shaved into head coach Mauricio Moore’s head, and then initially concealed from and later revealed to Cardenas to further the razzing. Chicks helped bring the joke to another level, likely introduced to the story and put up to the teasing by Moore, per Frey’s speculation. In the spirit circle, prior to revealing their MVP award from the game, the Chicks players announced they had a “very special award” to give out. They revealed an image of Cardenas’ lackluster self-portrait, eliciting hysterical laughter from the both teams. Naturally, the two sides than danced together once again to conclude their lengthy spirit meeting. It was a moment that showed what this tournament is when at its best: teams from all across the world and all different backgrounds, sharing moments of fun and commonality. It’s been a focus of Revolution’s to make sure all of their games are played with a high level of spirit.2 But it was clear that they shared an extra special level of enjoyment in their game and experience with Chicks. Comments on "Inside Break: Manuela Cardenas’ Self-Portrait"